It’s rush hour at Waverley station and somehow I am actually feeling quite composed. Perhaps it’s because I’m not running the usual 7 and a half minutes behind where I should be, as is the norm. Perhaps it’s because I’ve already located the platform I need to head to without too much hassle. Or perhaps it’s the fresh bagel firmly clamped between my fingers. No matter. The main thing is that I’m ready to go and looking forward to really seeing Scotland and for what the next few days has in store. This is day one of what can only really be described as an epic distillery tour on rails. 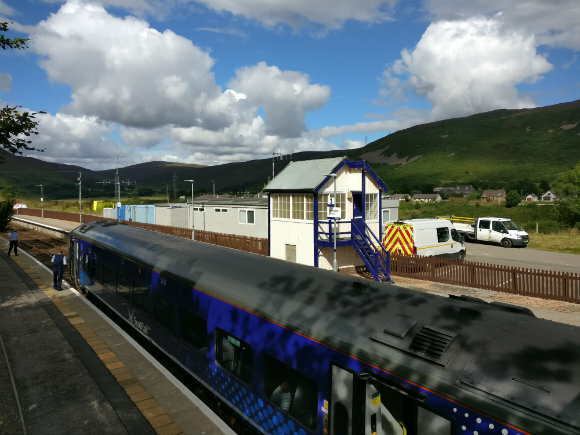 I’d been approached to try out Scotrail’s new Highland Rover Pass and see some of Scotland that I have never had the chance to visit before. Four days, five distilleries, and with more views than in your average copy of National Geographic. Who could say no? As the carriage sets off we’re wowed not only by the landscape as we whip our way through the countryside but also by the whimsical weather in which we’re shuttling through. The family from America three rows up from me are audibly awed by the fact that for a not insignificant amount of time rain poured down one side of the train whilst sunshine poured in through the windows on the other. I attempt to stoically take this in as if it happens all the time here in Scotland, however, my excitement gets the best of me and I run between the sides of the train a couple of times just to make sure. 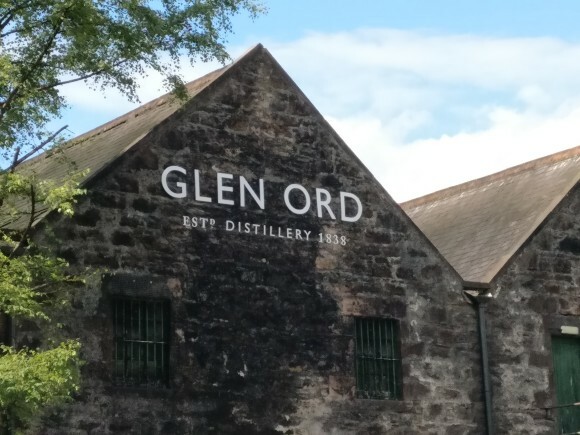 The first stop on the journey is Inverness, where there is just enough time for a brief lunch by the station before boarding another train to the Muir of Ord, which is home to the first distillery on my list – Glen Ord. I was excited to start my trip here. Not only was Glen Ord one of the first whiskies I ever loved it is damn near impossible to get hold of here in the United Kingdom. In fact, they proudly declare on their tour that you can ONLY buy the whisky at the distillery or in Asia. The distillery itself is huge. I mean really huge, and the concept that so many people in Scotland might never have heard of this whisky whilst so much of it was being made was one that I couldn’t get my head around for a while. After looking around the shop to make sure I haven’t missed any bargains I venture on to the village centre and have some dinner in the Ord Arms hotel. I eat now because the final leg of my trip isn’t until after eight o’clock. 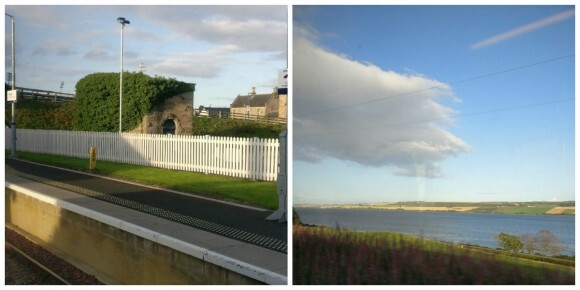 I board the train and head even further up the east coast to the bonny town of Brora. I arrive and quickly find myself at the Royal Marine Hotel, where I’ll be staying for the evening. After a quick check-in I retire to my room to put together some notes before calling it a night. The sun surrounds the hills around Brora the next day as I head along the road. I’m worried about taking a wrong turn, my map reading skills have led to many an unexpected detour, but I’m relieved to see an unmistakable shape on the horizon and know I am going the correct way. I’ve arrived at Clynelish distillery at the ideal time it seems; the renovations to the ‘new’ Clynelish have been finished only days before I arrive so I am able to not only visit that but also the old distillery of Brora as well. As we look at the Brora distillery, closed in 1983 and replaced by Clynelish, I can’t believe that it is still standing, stills and all. Most closed distilleries are razed to the ground as soon as they are no longer needed but here we have brick and mortar reminder of history. We pop our heads into the warehouse to see some of the few remaining casks of Brora, earmarked for some super-special release no doubt, before heading up the path to the newer of the two distilleries. It’s funny visiting Clynelish so soon after being at Glen Ord. The same company runs them both but they each feel very individual in what they do. I’m treated to an amazing tasting of some whiskies from past (Brora) and present (Clynelish), and all before midday! 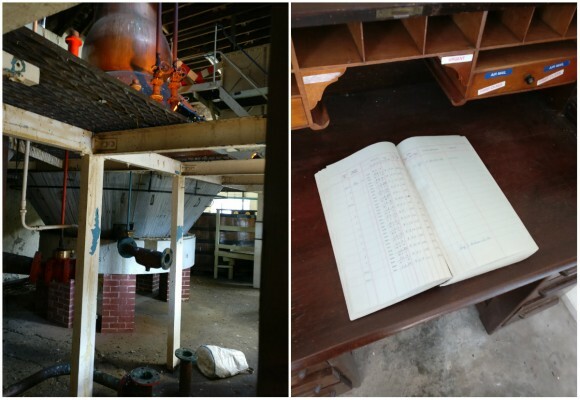 I find out more of the local history and just what the distillery means to the local people. It’s quite something to sit and look out at the view from their tasting room whilst enjoying a whisky from a lost distillery. Before I know it it’s time to head down to the nearby train station and hop onto my next ride. I’m off North again, further North than I’ve ever been, to the old fishing town of Wick. The views are fantastic along the route and I try to crack open my book on three separate occasions before casually laying it down in front of me and sinking into the scenery whipping by the window. When I arrive at Wick I get my first (and only) taste of proper Scottish weather. The heavens have opened and rain is bouncing off the pavement into the road. People are huddled at the exit of the station but it shows no sign of stopping. So, I decide to brave it and make the short walk to the Norseman Hotel where I’ll be staying. Wick looks beautiful in the rain but I’m relieved to take shelter, pull off my boots and wait for the clouds to break before heading for an early dinner. I pop outside for an early evening walk around the town before calling it a night and retiring to my room. There’s more to do tomorrow. I bid farewell to the kind folks at the Norseman and head up the long steady hill to the Pulteney distillery. 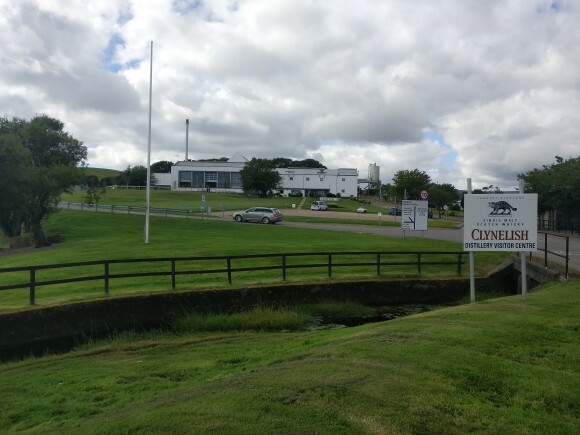 Amazingly, even though I have friends who work for the company, I’ve never had the chance to visit and I’m excited to see the whisky that’s made here. Wick has an interesting relationship with alcohol, they may have their own distillery but they also brought in Prohibition laws in 1922, which lasted until 1947! During this time no alcohol could be consumed or sold in the Parish and every local pub had to close its doors for as long as the ban was enforced. Now, however, these laws are no longer in place and I am able to sample some of the wares from the distillery. One of the main things I’m amazed by here is how surprisingly small the distillery is compared to how well known it is. In complete contrast to Glen Ord, which produces almost ten times more whisky than Pulteney, it’s seen in bars all over the UK and across the world. An amazing feat for a whisky made in a small little harbour town. In what has become a familiar trend, it feels all too soon before I bid farewell to the team and head back towards the station. I take a slightly alternative route and take in the world’s smallest street, Ebenezer Place (it is literally one door) before boarding the first of the trains that will start to take me back South. I take in the views again, this time I make sure to sit on the opposite side to make sure I haven’t missed anything and head to Inverness before grabbing a connecting train to the heart of Scotland’s whisky industry; Speyside. To be more accurate I’m heading to Forres and checking into the Cluny Bank Hotel. After getting myself freshened up after a long journey I head to their Franklin’s Restaurant for what is the standout dinner of my trip. Every part of it is delicious and I retire to my room feeling content and ready for the final stretch of my journey. It’s another stunning day as I head towards one of Speyside’s smallest distilleries for my penultimate tour. Benromach is one of the few established independently owned distilleries in the country and as such tend to have their own way of doing things. 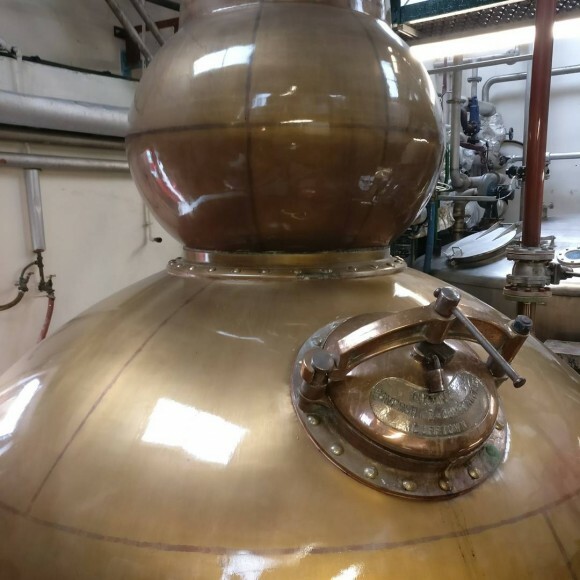 They use different yeast strains, have a firm policy of only using first-fill casks and unusually use peated barley to give their light Speyside whisky a smoky kick. We’re told that we’re lucky we’ve come on a Friday morning as it’s a busy time and we get to see some of the casks being filled and weighed by hand. 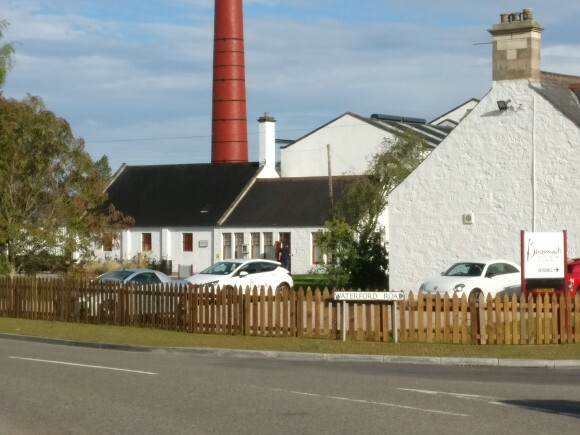 It’s great to see this traditional approach to whisky making and it is difficult to pull myself away when I have to grab the train to my final destination of Strathisla in Keith. However, once I see Strathisla on such an amazing day all thoughts of other distilleries go out of my head. Strathisla is Scotland’s oldest continually working distillery and it has kept many of its amazing original features. It’s not surprising but photography is not allowed in their wooden roofed still house due to the fire risk, but it something you really have to see for yourself. Strathisla is also the single malt whisky most used in the production of Chivas Regal and as such we are treated to the story of the Chivas Brother’s and how they built their empire. It’s the first real mention of blending on my trip and a welcome one; blends are hugely important to the whisky industry. With the tour finished I walk back out into the sun and head to the train station to head home to Edinburgh via Aberdeen. After going through the Highlands for the past few days the busy train from Aberdeen is a vast contrast to the sparsely populated carriages I’m used to. It’s the sight that makes me realise that my Highland Rover adventure is almost over. Well, over for now anyway. The Highland Rover pass is great value for money and I’ve already had several friends tell me that we’ll be heading North on our own adventure soon. Even though I packed my trip into four days the pass is valid for eight (with four days of unlimited travel included) and I’ll be sure to spend a bit more time in some of the amazing towns and villages to see what other hidden things I can find in them. I was lucky enough to take part in this trip thanks to the#UnlockScotland campaign and you can find out more details over at www.scotrail.co.uk. 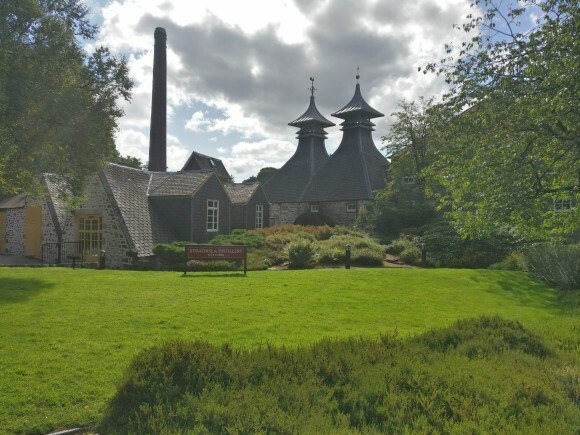 Scotland is full of distilleries, with more opening every single day and this is the perfect way to explore visit a lot of them without having to worry about driving. If you can stay organised, composed and make sure you don’t fall your usual seven and a half minutes behind then you’ll have an amazing time. This entry was posted	on Tuesday, September 26th, 2017 at 9:29 am	and is filed under Musings. You can follow any responses to this entry through the RSS 2.0 feed. Responses are currently closed, but you can trackback from your own site.